Before I write about Boxeuses, I would like to discuss Bas de Soie, a fragrance which joins the ranks of the Serge Lutens export collection. “Silk stocking,” as its name translates from French, Bas de Soie certainly conveys a rustling, shimmering sensation of silk, although at times, it disconcertingly veers towards sharp and metallic. Even if it is tempting to talk about a new direction for Lutens, I only have to recall the pallor of Clair de Musc (2003), the watery limpidness of Fleurs de Citronnier (2004), the transparency of Gris Clair(2006), and the sweet delicacy of Louve (2007.) Likewise, in Bas de Soie, the familiar dark, magnetic Serge Lutens character is not to be found. If your idea of a fragrance merges the coldness of hyacinth with metallic rose and the luxurious softness of Santa Maria Novella iris soap, then Bas de Soie is a perfume for you. Certainly, Bas de Soie is an unusual scent, offering a different interpretation of iris. It is worlds apart from the earthy opulence of Iris Silver Mist, where the iris is rendered in a very natural manner, with all of the facets of the raw material magnified and enhanced. Although I cannot compare Bas de Soie to Iris Silver Mist, it most strongly reminds of Chanel’s modern iris treatment in 28, La Pausa. It is likewise sheer, crisp and pale, with all of the dark, powdery heft of orris attenuated so much that only some metallic shimmer remains. Yet, if 28, La Pausa is singularly orris, Bas de Soie is more than that. It treats iris as a metallic accent, which pierces the green almond and honeyed rose accord of hyacinth. The characteristic floralcy of hyacinth is underplayed in this composition, and instead the flower is made intensely green and sharp, verging on patently artificial. Layered over the metallic and powdery notes, the core of Bas de Soie suggests a clean and fresh impression. 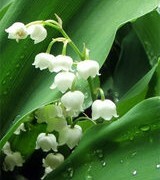 The downside is that it occasionally enters the territory of functional scents with its crisp muguet character. That is what one would expect to find in a soap or a fabric softener. Although the composition never feels cheap, the functional association nevertheless detracts from its allure for me. On a purely theoretical level, it is an interesting concept, but it fails to capture my attention on skin. Bas de Soie is sold in the export range. The export line fragrance are available from Aedes, Beautyhabit, Luckyscent, Barneys, Bergdorf Goodman, and from some Neiman Marcus locations. carmencanada: I likewise found Bas de Soie metallic and soapy — in fact, I think I called it something like “toxic soap” because of its toughness. It is also, as you say, very artificial: this is obviously deliberate. 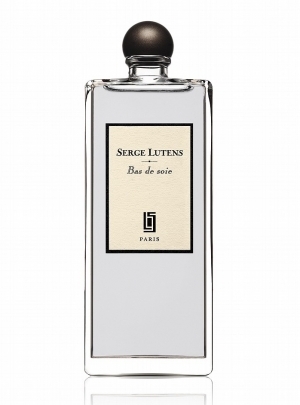 In a way it’s not so far from L’Eau Serge Lutens, in addition to the other fragrances you quote, in the sense that it plays on the codes of “clean”, but in a different register of notes. fran: bas de soie really really works for me. one of the greatest in my view (and i generally love the more warm and oriental stuff of lutens – as well as encens et lavande). that some people find it soapy, that i get, but i do not find the iris powdery at all. to me it is sharp, metallic and clean and oh so classy, with this little nasty undertone which makes you wonder whether it is really that clean. OnWingsofSaffron: Hello Victoria, in a thread refering to Hermès Cardamusc you rightly asked whether I might not have been able to smell the musc – hence my reservations. That indeed is true, especially with Goutal Musc Nomade where I need to splash litres in order to smell something! That is not the case with Lutens Koublaï Khan, which I can smell very well and enjoy tremendously. Victoria: Different musks register differently, so you may be anosmic to one type but not to another. OnWingsofSaffron: Makes sense, what you say.